Bydd Carlos Fonseca yn siarad yng Nghaerdydd yr wythnos nesaf (ac wedyn mewn llefydd yn Lloegr, yn cynnwys cynhadledd America Ladin yn Llundain) – gweler fan hyn am fanylion y cyfarfod. Yn y cyfamser, mae Nicaragua Solidarity Campaign (gweler fan hyn am ei wefan), sydd wedi trefnu’r daith, wedi cyfweld Carlos ar gyfer y daith. Mae’r cyfweliad isod – rhywbeth i feddwl amdano i helpu paratoi cwestiynau ar gyfer y cyfarfod! 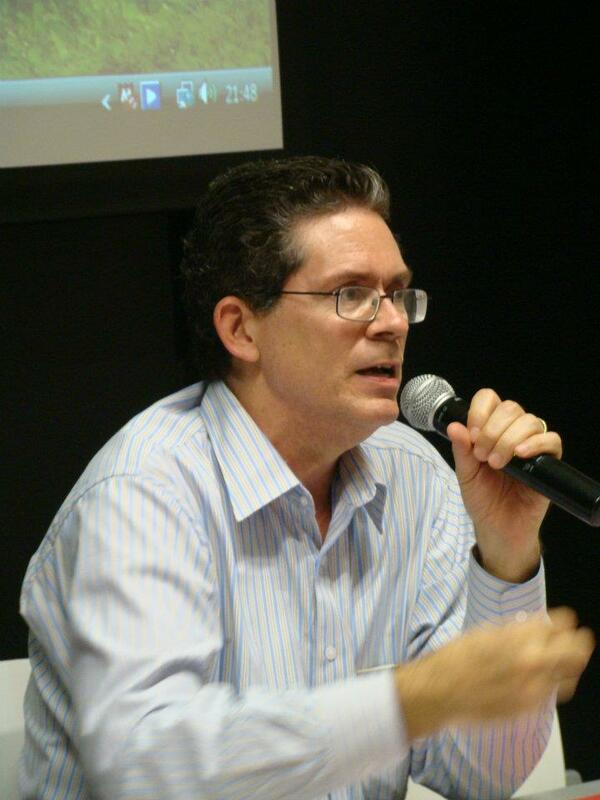 Carlos Fonseca will be speaking in Cardiff next week (and then on tour in England, including the Latin America conference in London) see here for details of the meeting. In the meantime, the Nicaragua Solidarity Campaign (see here for their website) who have organised the trip, have interviewed Carlos for the visit, The interview is below – something to mull over to help prepare questions for the meeting! Carlos Fonseca from the International Department of the FSLN (Sandinista party) will be in the UK from 3 – 13 November as a guest of the Nicaragua Solidarity Campaign (NSC). He will be speaking at the Latin America Conference on 7 December in central London. Liz Light, the NSC representative in Nicaragua, interviewed him in Managua. What are the key messages that you want to get across during your visit to UK? In the first instance to explain the direction the FSLN has defined for the revolutionary transformation of Nicaraguan society, how this manifests itself in economic and social policies and programmes and the political model that we are promoting. Fundamental is the achievement of improvements in the living conditions for the majority of the population. Politically speaking it is incredibly important that the international community and progressive forces in the world know what we are doing, since there are detractors who attack the FSLN and seek to disparage our credibility. What do you consider the key achievements of the Sandinista government since returning to government in 2007? Politically, one key achievement has been the setting up of Councils for Citizens Power in neighbourhoods – we see these as an expression of direct democracy based on the belief that citizens do not only elect government representatives but also decide on government policies and what their representatives should be doing. This is a long term learning process which implies changes to the country’s political culture. As always when working on something so difficult there will be failings and these errors are taken advantage of by our adversaries to insist that the project is not viable. The impact of social programmes in reducing poverty has meant that we hold second place in Latin America for the greatest reduction of inequality after Venezuela. One of the first things that the Sandinista did after coming to power was to join *ALBA and this has been crucial to realising our revolutionary project. Through an agreement between the two countries Nicaragua buys oil from Venezuela and pays half of the cost within 90 days, either in cash or in the form of food exports such as beans and beef. The other half is converted into a 20 year loan at 2% interest. Nicaragua invests these funds into social programmes such as Zero Hunger which has provided support for over 100,000 rural women and their families; Zero Usury supporting 130,000 women with low interest loans and training to set up micro-businesses; and credit and training in the production of basic grains for small farmers, as part of the reactivation of the agricultural sector to improve food security. In addition we have renationalized education and health which are now free; illiteracy has been cut from 36% to 3%; and over 100,000 people have benefited from an affordable housing and home repair support programme. In the last period of the neoliberal government an energy crisis meant hours of blackouts on a daily basis. It would have been impossible for the Sandinista government to resolve the energy crisis as we did if we hadn’t jointed the ALBA initiative, so it is fundamental for our country. We are also very proud of the fact that Nicaragua is relatively safe compared to other countries in Central America even after demobilising 185,000 soldiers when the war ended. The Sandinista Revolution did a lot to change the consciousness of society including the integration of the police force into the community. What is the significance of ALBA and Petrocaribe to Latin America integration? Culturally and historically, Latin America is one nation and we should express ourselves as a single country or state just as Bolivar, Marti, Sandino and Morazan all stated. ALBA and Petrocaribe are part of this continental socialist transformation. This is important not only economically but also ideologically as part of the Latin American Bolivarian Project. How has the alliance between the government, workers and private enterprise contributed to realising the revolutionary project of the government? In the interests of economic stability and the promotion of our revolutionary project we need private enterprise, an alliance that has functioned very well. There are almost 70 laws that have come out of this consensus – such as minimum wage – which have contributed a lot to the country’s economic stability, so that investors feel confident. It is an alliance in which we defend the interests of the workers while avoiding confrontations. In the 80s this didn’t happen because private enterprise identified the FSLN as its enemy. However, they have now realised that Sandinismo is a part of Nicaraguan reality. Which is why, very pragmatically, they understand that either they have to leave Nicaragua or learn to coexist with us. Why does the Sandinista government still depend so heavily on the aid – especially from the European Union – and loans from the IMF? Approximately 30 per cent of our national budget comes from foreign cooperation so it is still vital for our economy. The situation we aspire to is to free ourselves from the IMF, but while our productive capacity remains fragile we depend on foreign cooperation. Many of the countries that provide aid to Nicaragua belong to the EU and a condition of that cooperation is IMF approval of Nicaragua’s national budget. In the medium term things are going to change: with the Interoceanic canal project Nicaragua will have the resources to be able to do without the IMF and foreign cooperation. A gender equality index of the World Economic Forum recently ranked Nicaragua 10th in the world compared to the UK at 18thand the US at 23rd. How have government policies contributed to this achievement? For many years the FSLN was the only party whose internal norms included a quota for women’s participation for internal party positions and as candidates for public office. It was initially 25% and is now 50%. This has meant a continuing increase in women’s holding public posts. We are now proposing that these quotes should be written into the constitution. A fundamental part of the revolutionary struggle is the fight against gender oppression including economic and political oppression. The government’s main social programmes have a strong gender vision. During the first years that these programmes were exclusively aimed at women, it was the women who controlled the resources in order to encourage greater independence and autonomy on an economic level. In this way we have advanced considerably. What are the key government programmes for the coming few years? The most strategically important is the interoceanic canal. Nicaragua’s National Assembly has approved a bill to grant a 50-year concession to the Hong Kong Nicaragua Canal Development Investment Co (HKND) to conduct a feasibility study and build a 250km inter-oceanic canal across Nicaragua at a cost of US$40billion. Feasibility studies are being carried out to make sure it is done correctly, with the knowledge that the benefits for the country are going to far outweigh the costs. There are two particularly key issues related to the canal – the environment and national sovereignty. The primary interest of all those involved in the canal project is to protect the water resources, which will never happen without the canal. In addition the canal will guarantee the foundation of our national sovereignty which is economic independence. Construction is due to start at the end of 2014 and will last approximately five years. Since 2006 the Nicaraguan economy has grown on average by 4 to 5% annually. This economic growth has been the reason behind achieving much more social equality than other countries in the region. With the canal we estimate that economic growth will reach 15% annually. This would represent a major advance for the country – it will provide resources that would be impossible to obtain in any other way and would have a huge impact in reducing unemployment. All our social programmes to to reduce poverty and inequality will continue. On a political level we will strengthen the process of direct democracy through citizen participation. One of the main tasks will be to raise awareness among the population that to have a better life you need to participate in decision making about how state resources are used in your neighbourhood or community. Why is international solidarity important to you? International solidarity is not only an economic issue, it’s also about moral and political solidarity, that revolutionary support from around the world from progressive people who identify with our ideals. But we have a very welcome problem in that in the 80s Cuba and Nicaragua were the only revolutionary novelties in the world so everybody came to support us but now there is Venezuela, Ecuador, Bolivia, and of course Cuba without which none of what we are doing would have been possible. So now people have an abundance of options as to express solidarity with. This has contributed to Nicaragua being ignored. It’s obviously a welcome problem as we are not alone in Latin America, however we need to remind people that Nicaragua and the Sandinista Revolution still exist. * ALBA, the Bolivarian Alliance for the Peoples of our America, is made up of Venezuela, Bolivia, Cuba, Ecuador, Nicaragua, Dominica, Antigua and Barbuda, and Saint Vincent and the Grenadines. It is an alliance based on social, political and economic integration that promotes human and economic development through solidarity, mutual trust and respect. 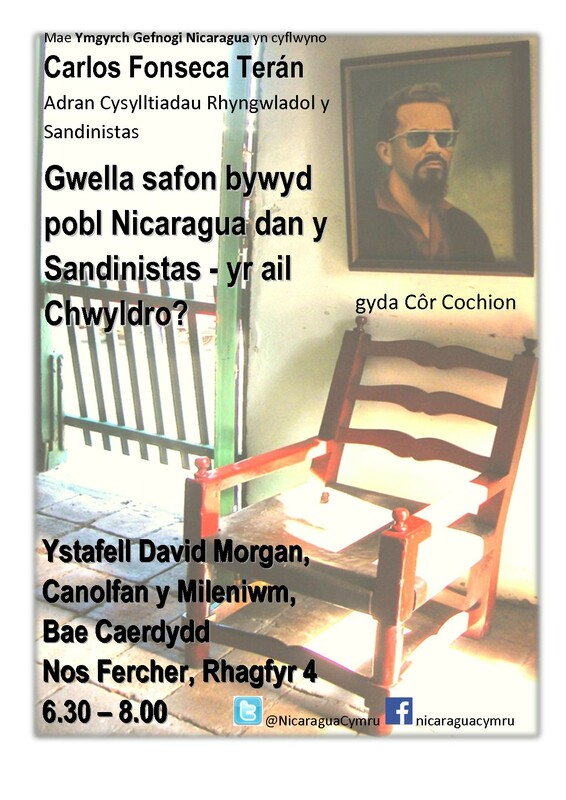 Er fod mae pobl o Nicaragua yn siarad yn gyson yng Nghymru, hwn yw’r tro cyntaf ers yr 80au i rywun o Adran Cysylltiadau Rhyngwladol y Sandinistiaid (y DRI) ymweld a Chymru. Roedd Carlos yn aelod o Senedd Nicaragua rhwng 1997 a 2002. Ers 2008 mae wedi bod is-bennaeth y DRI. 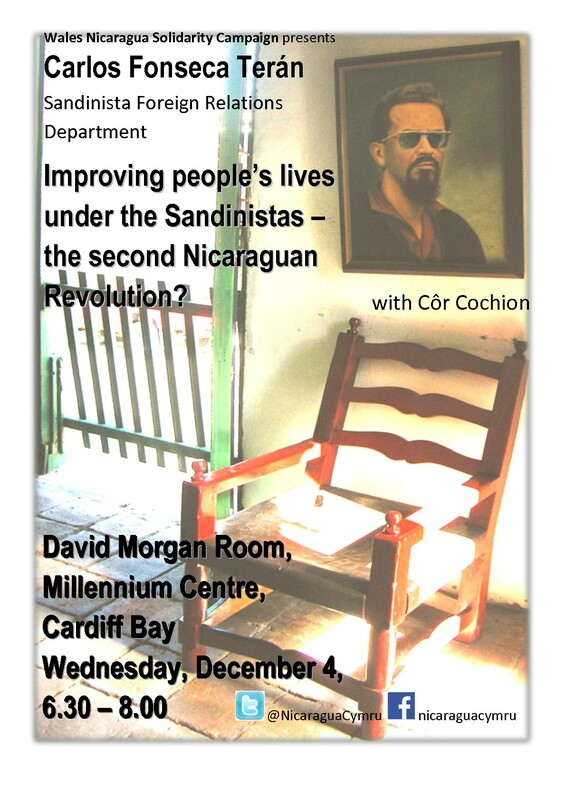 Although many Nicaraguans frequently come to Wales to speak, this is the first time since the 1980s that a representative of the Sandinistas Foreign Relations Department (the DRI) has visited. Carlos was a Nicaraguan Assembly member from 1997 to 2002. Since 2008 he has been the deputy head of the DRI.